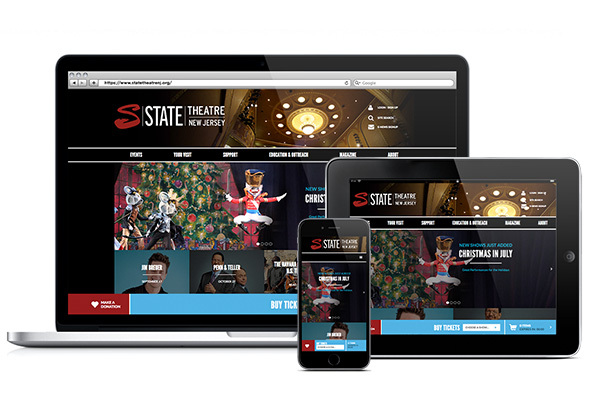 L2 Interactive is pleased to announce the launch of State Theatre New Jersey’s newly redesigned and rebranded, fully custom Tessitura-integrated website. The historic State Theatre, now a performing arts center, was originally built as a vaudeville and silent film palace. 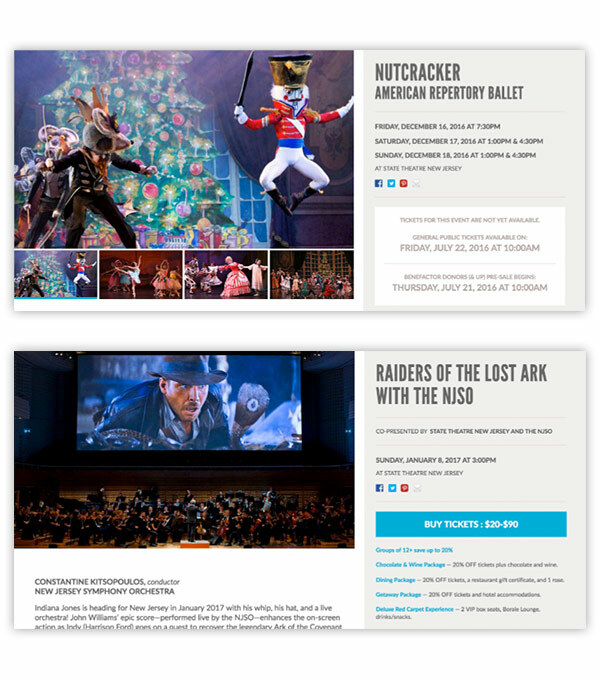 Today, it attracts over 225,000 patrons annually to a variety of offerings, including international orchestras, Broadway musicals, world-class dance, stand-up comedy, pop, jazz, children's theater, world music, and educational programs. When State Theatre came to L2 to discuss a rebranding and redesign project, automation was key. The sheer number of offerings presented annually necessitated custom automation and functionality within production pages and upcoming events listings, while the variety of offerings called for a completely custom Print at Home ticketing system and custom erube driven ticket confirmation email. Additionally, a new Account Center features robust control and tracking for patrons. 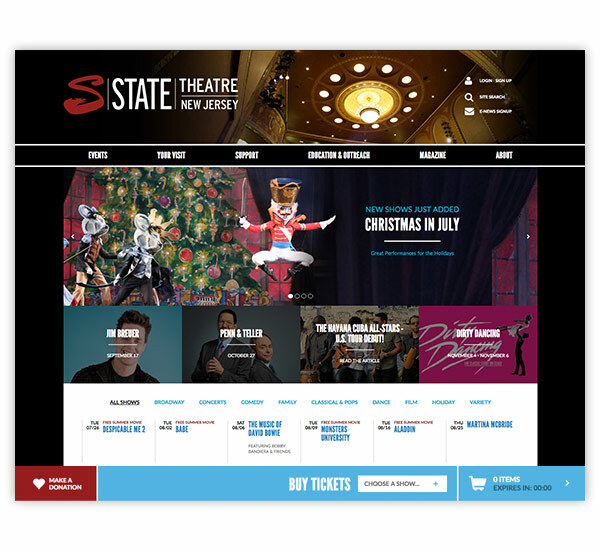 For State Theatre New Jersey, L2 completed both a rebranding and redesign initiative. For the re-branding, L2 delivered a new logo and style-guide, taking a fresh look at The State’s classic “S”. For the redesign, L2 sought to showcase State Theatre’s historic venue as well as its diverse set of offerings in a clean, easy to navigate structure. Included in this redesign was a permanent buy tickets bar, that launches a customized donation or ticketing widget, which allows patrons continuous access to the donation and ticket purchase path regardless of which page the user is viewing. For State Theatre New Jersey, L2 automated pre-sale and public on-sales on the production detail pages. Now, no one has to sit at home on a Saturday to make sure that a sale begins as it should. The State can set start times for pre-sales and on-sales and the production detail pages respond automatically with customized messaging during a pre-sale, and a buy tickets button at public on-sale. L2 also automated specialized upcoming events lists. State Theatre has a number of performances that fall into different categories. Performances may be a part of a special package, have related events or add-ons, or be geared for different school groups. For example, by flagging a performance as a Relaxed Performance, all productions with this flag are fed to State Theatre’s Relaxed Performances page. The State has full control over which performances pull onto which pages, and they can add new event categories on-the-fly without needing updates from L2. 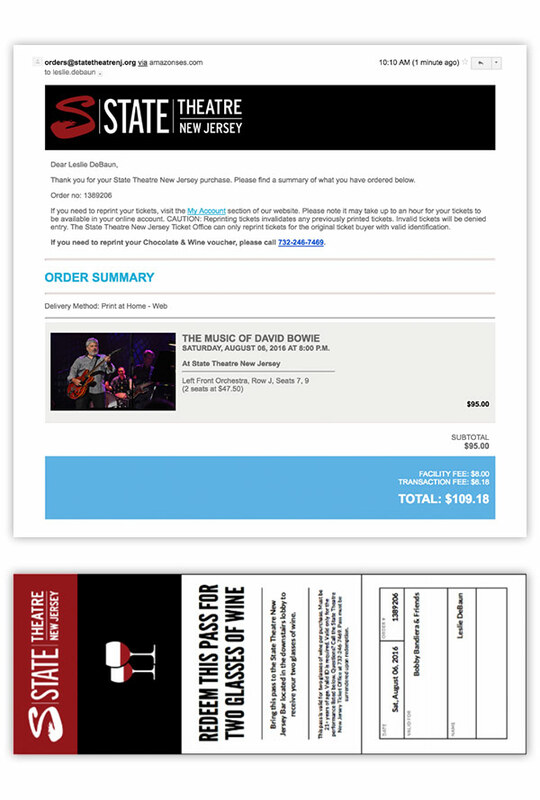 To facilitate the range of programming State Theatre New Jersey offers, L2 built dynamic ticket confirmation emails, specialized cart messages, and customized Print at Home tickets and vouchers. The eRube driven ticket confirmations dynamically populate messaging and images along with confirmation details of the items purchased. The cart messages ask any additional questions The State needs to fulfill their offers, and the offers are fulfilled via the Print at Home vouchers — no follow-up from staff necessary. For example, a user purchases a “Chocolate & Wine” package, messaging pertaining only to that specific package is triggered in the cart and in the email confirmation, and the voucher for the chocolate and wine is included when the user prints out their tickets. State Theatre’s robust account center also saw its fair share of customizations, including RSVP functionality. 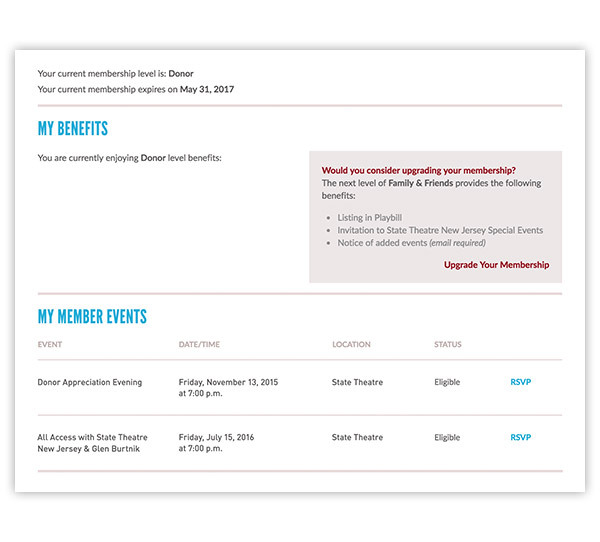 Within the My Membership section of the Account Center, patrons can update responses to invitations to Activities in Tessitura, just like the functionality included in the Mail2 RSVP/Survey module. 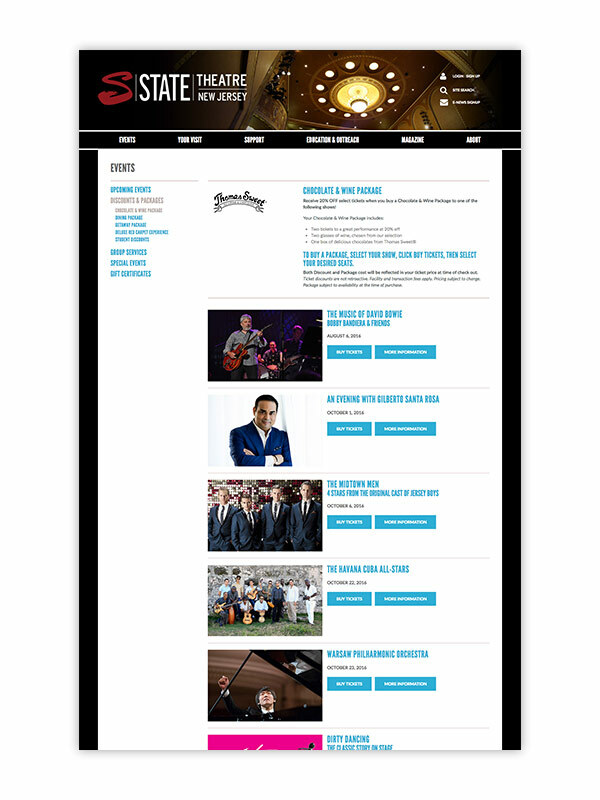 So, a patron can receive an invitation via Mail2, then go to the Account Center on the website to view all of their upcoming events and make any updates or changes — all updating real-time in Tessitura.